First off we have the Bushiroad news. With Weiß Schwarz, today sees the release of "THE IDOLM@STER CINDERELLA GIRLS" in the form of three Trial Decks, a Booster Set and a Meister Set all in English. Next Friday will see the release of Card game Shiyoko Ultimate Starter in Japanese. 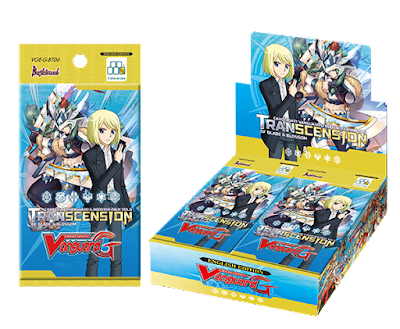 Also with Cardfight Vanguard, today sees the release of the G Legend Deck 2: The Overlord blaze "Toshiki Kai" in Japanese. Next Friday will see the release of G Trial Deck 8 "Vampire Princess of the Nether Hour" and G Booster Set 6 "Transcension of Blade and Blossom" in English. This and G Booster Set 7 are the sets that I am currently looking forward to. Six has Nova Grapplers and Seven has Dimension Police. There is a Sneak Peek for G Booster Set 6 at Wargames Workshop MK. Sadly due to working I will not be able to go. Next is the HeroClix news. 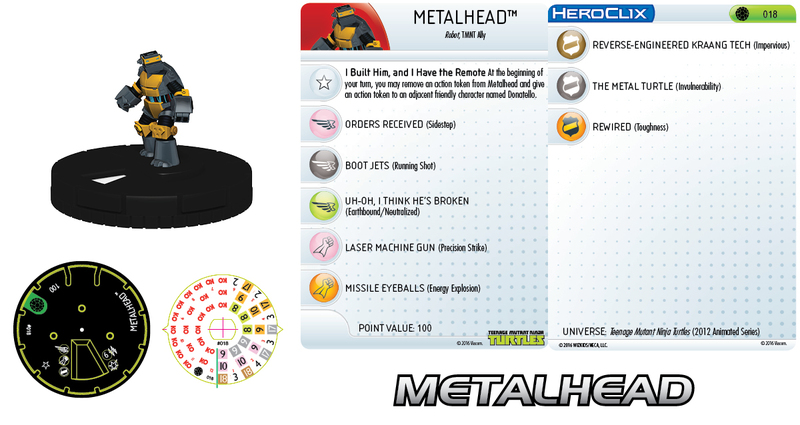 This week we got previews of: Metalhead and Casey Jones from Teenage Mutant Ninja Turtles. Now for the Privateer Press news. Their Widower's Wood is still going on. As I post this they have managed to unlock since the lost post: A new reward level called Luxury which is basically Premium with a KickStarter exclusive table top dice tray; a Boss Swamp Gobber was added to all pledge levels apart from the Core Game one; a KickStarter exclusive Blackhide Wrastler was added to all pledge levels apart from the Core Game one; and four more Club Gatormen and a KickStarter exclusive mission was added to all pledge levels. 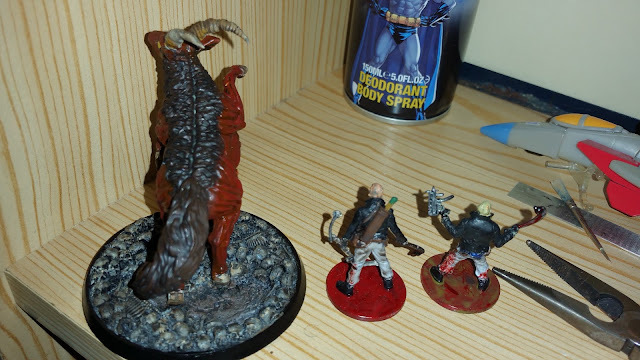 As I post this the stretch goals that are still going were: A Boss Small Tatzylurm will be added to all pledge levels apart from the Core Game one at $287k; six Tomahawk Gatormen will be added to all pledge levels apart from the Core Game one at $300k; a Boss Gatorman Bokor will be added to all pledge levels apart from the Core Game one at $312k; two more Gatormen Bokor will be added to all pledge levels at $325k; three more KickStarter exclusive missions will be added to all pledge levels apart from the Core Game one at $337k; and a KickStarter exclusive Swamp Horror will be added to all pledge levels apart from the Core Game one at $350k. The KickStarter will be ending on Sunday. Let us see what they can unlock between now and then. Next is the Cryptozoic news. Next month they are returning to KickStarter to fund Ghostbusters The Board Game 2. Now for the Kingdom Death news. For one week only, all the expansions for Kingdom Death Monster (apart from the Lantern Festival due to not being ready and the Spidicules most likely due to the problem with the legs) are all up on their web store for one week that ends on the 21st. I have managed to pick up all three Knights. I was planning on getting the Green Knight Armour set too however I learnt that you need to get two or three more of the other expansions to use it. Afterwards the expansions will be release normally onto the store as a general release in a slow manner. Lastly is the Modiphius news. With their Infinity RPG they are still working on the Wave one books, however from next week they will start shipping the miniatures if backers want to pay extra for the postage. On the belowKickStarter Dates" section I have pushed wave one to April, however I do doubt that it will ship by then. With their Thunderbirds KickStarter, wave two will start shipping next week. People who added the RPG support (like me) will have to wait about week later as the RPG stuff will arrive at the warehousessome time next week. “Dragon Tide” (September 2015), “Slaughterball” (June 2015), "Dwarven Forge's City Builder Terrain System”, wave 1.5 of “Shadows of Brimstone” (August 2014) and “Yashima: Legend of the Kami Master” (July 2015) are all currently shipping. “Deadzone Infestation” (January 2016), wave two of “Thunderbirds Co-operative Board Game” (December 2015), "Mechabrick Upgraded" and "Warbears and Stagriders, Fantasy Wargames Miniatures" should shipping this month. Wave one of the “Infinity RPG” (February 2016), "The Others: 7 Sins" (March 2016) should ship in April 2016. "Masmorra: Dungeon of Arcadia" should ship in November 2016. "Widower's Wood" should ship in January 2017. On Saturday the 20th of March 2016, there will be both a Weiß Schwarz Tournament and a Cardfight Vanguard Sneak Peek at Wargames Workshop MK. Please check the "CFVanguard and WeißSchwarz M.K." Facebook group for details. On Saturday the 26th of March 2016, Guardians of Tyr will be running a Game of Thrones the card game tournament at Wargames Workshop Northampton. On Saturday the 2nd of April 2016, Guardians of Tyr will be running a Steam Roller Warmachine/Hordes tournament at Wargames Workshop MK. On Sunday the 3rd of April 2016, Guardians of Tyr will be running a Warhammer 40,000 Conquest tournament at Wargames Workshop Northampton. On Monday the 4th of April 2016, will be the third part of the Frostgrave campaign being played at Wargames Workshop MK. We will be meeting up once a month on the first Monday of the month for ten months. 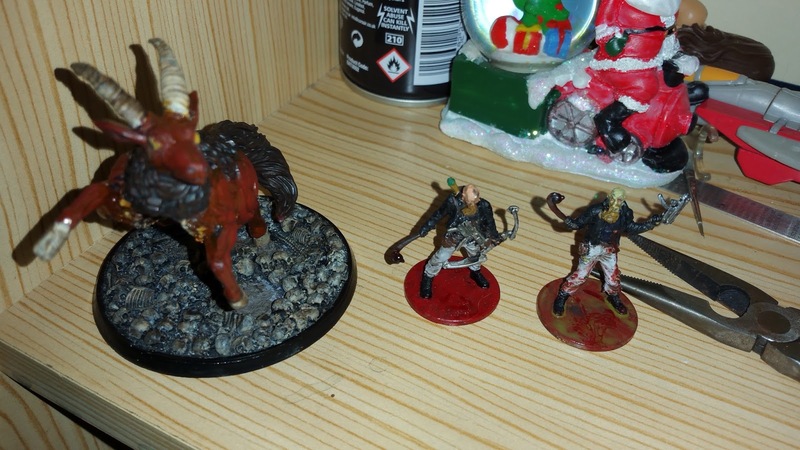 For details please check the "Frostgrave: The Beginning" Facebook group. On Saturday 16th of April 2016, Salute will be happening at the ExCel London. This year's theme is Steam Punk. On Sunday 17th of April 2016, Guardians of Tyr will be running a Netrunner tournament at Wargames Workshop Northampton. On Sunday the 1st of May 2016, Guardians of Tyr will be running a Star Wars X-Wing tournament at Jury's Inn MK. On Saturday 7th to 8th of May 2016, Campaign will be happening at the Centre MK. On Sunday 15th of May 2016, Guardians of Tyr will be running a Steam Roller Warmachine/Hordes tournament at Wargames Workshop Northampton. 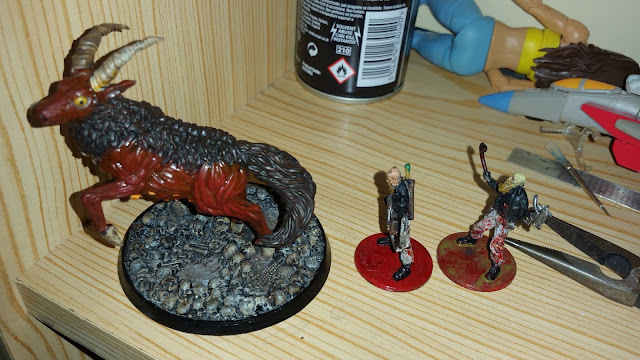 This time I have for you all both version of Terry from Zombicide and the Screaming Antelope from Kingdom Death Monster. 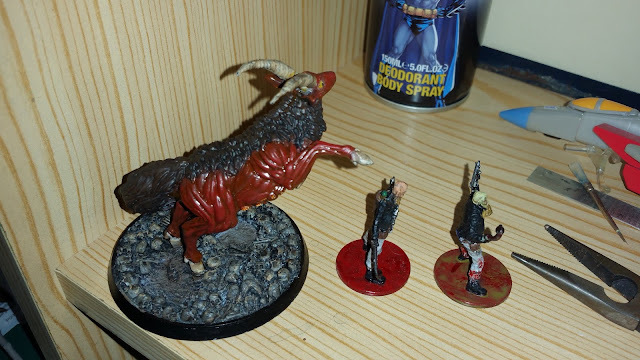 On Tuesday's post I should have for you all the Butcher from Kingdom Death Monster. Friendly Neighborhood TableTop Day Event Preview! Why You Should Play... Zombicide: Black Plague!